Young chum salmon with fat, caught offshore. Salt content about 3%. Simply defrost, cook with a fish roaster or other implement, and enjoy. These young chum salmon are caught in spring through summer, and are known for their fat content. They are soaked in salt water to give them a salt content of about 3%, and then matured for 24 hours to bring out their umami and mellow the flavor of salt. 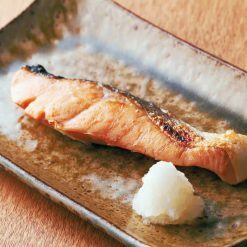 The young chum salmon that migrate through the open seas of the North Pacific near Russia are called “tokisake.” The chum salmon that return to the waters nearer Japan in the fall are called “akisake.” Anyone of any age who tries these “tokisake” will be sure to appreciate its naturally well-balanced fatty portions. Sugarlady’s seafood is caught in season and processed right away, ensuring that you always receive the highest possible freshness and flavor. 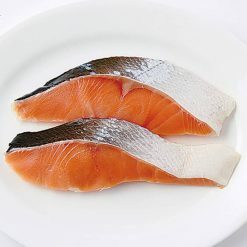 Because this young chum salmon comes sliced and ready to use, the amount of time you need to set aside for preparing fish dishes can be drastically reduced. In addition, because the fish comes frozen, it is easy to have plenty of it on hand at any time without worrying about it spoiling. Sugarlady’s seafood and other frozen products allow you to cook meals from all sorts of real, nutritious ingredients whenever you desire, even on the busiest of days! Defrost in the refrigerator, or by placing (still in its bag) beneath running water. Cook with a fish roaster or other implement and enjoy. This product contains chum salmon (Russia), table salt.. Origin of ingredients: chum salmon (Russia). Prepared and packaged in Japan.